New Washington state Supreme Court Justice Mary Yu recites an oath during her swearing-in to the bench Tuesday, May 20, 2014, in Olympia, Wash. Yu, a former King County Superior Court judge, was sworn in as the newest member of the court, marking the first time the high court has had an openly gay justice. 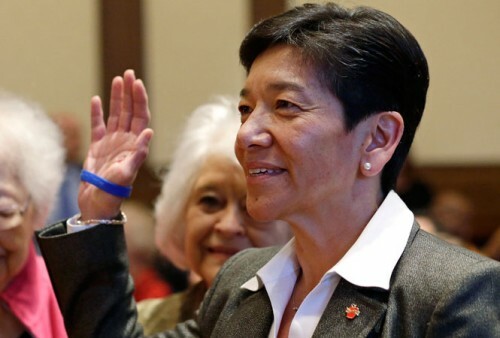 OLYMPIA, Wash. — Mary Yu was sworn in as the newest member of the Washington state Supreme Court on Tuesday, marking the first time the high court has had an openly gay justice. Yu served as a King County Superior Court judge for 14 years. Previous to that, she was the deputy chief of staff to the late King County Prosecutor Norm Maleng. To keep the seat, she will have to run for election in November to serve the rest of Johnson’s term, which was set to expire in January 2017. In 2011, Yu, along with Gonzalez, received the Outstanding Judge of the Year award from the Washington state Bar Association for their work on researching racial disparity in the state’s criminal justice system.